New to bonsai. Advice needed/appreciated. You have a juniper tree. Looks to be either Juniperus chinensis, or Juniperus procumbens. Both are closely related. These are easy bonsai to care for. If that gravel is glued onto the soil surface, then you need to remove it. You cannot check for soil moisture if the gravel is in the way. Watering should not be an everyday scheduled routine, but should only be done when the soil feels dry to the touch. Some people use their finger to test soil moisture, others use a chopstick. It is best to keep the soil moist, but not soggy wet. The soil should have good drainage, or else you'll be dealing with root rot. So a good drip tray of some sort is recommended. I have three junipers and they stay outdoors therefore receiving real sunlight, and they can properly go dormant for the winter. As with most, if not all conifers, they thrive outdoors, but they can be grown indoors given the correct lighting conditions and moisture. If grown indoors, I would not place the tree near a heat vent, on top of a t.v., atop a fireplace, etc of any sort. Welcome to the Forum, Thms! (interesting, that could be Thomas or Thumbs*) Most people say that it is very difficult to keep juniper alive indoors, they really need that period of cold dormancy. But you didn't say where you are located. If you are in a cold winter area and it is winter now (not say New Zealand or somewhere where it is summer now), and you don't know where the tree has been growing, you wouldn't want to just dump it out in the cold when it hasn't been used to that. But if you are keeping it indoors, not only avoid heat vents, but put it in your coolest spot. If you have a sunroom that's not heated or a cold basement or garage, that would be the place for it. I have a coat closet right by the front door, in the airlock entrance that I use for that kind of thing. Once dormant it will require very little light, water, and no fertilizer. *or Thames, like the River...or Thymes .... did I miss any? Thanks for the responses! 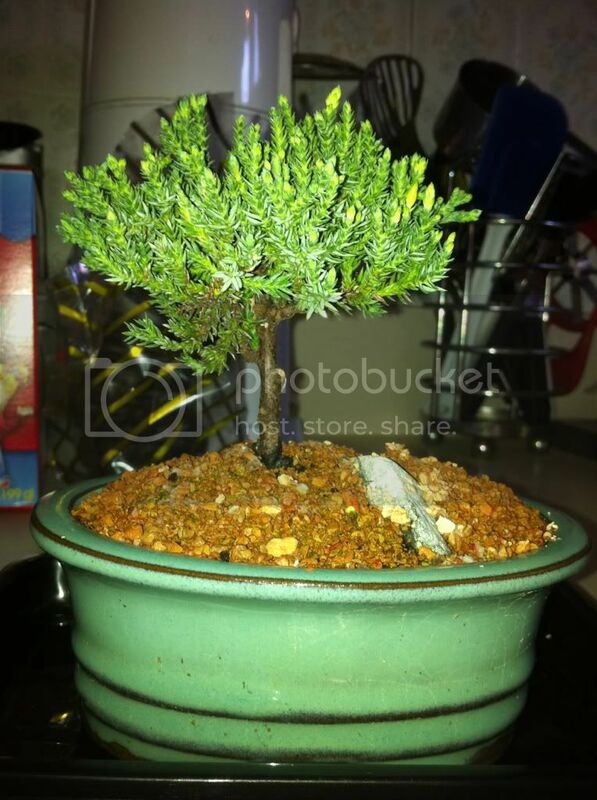 I received a paper with it saying it came from "celestial bonsai" (celestialbonsai.com) my mother gave it to me and I very much want it to succeed. I am on the east coast U.S. it has been living on a window sill where it receives a few hours of sunlight (granted there is any) per day. Would it be best to move it into a less lit spot to remain dormant (not sure if it is or how to tell) and should I be leaving it alone outside of checking soil moisture? It came with a drip tray but the instructions were to maintain a full level of water in the tray, but that doesn't seem right to me. Sorry for the wall of text, as I'm rattling this off on lunch break. You may want to modify your profile. To one that lists oh say a city and state. Juniper is a hearty conifer. It needs a sleepy time that is suprisingly cold and wet. Colder and wetter by far than your willing to live in. I have a few tender mediterainian and deep southern trees under lights as I write. As soon as spring rolls up, out they'll go back into the sun outdoors. Your Juniper (if it is to live) is headed to a comparable bench. Tomc, thank you very much. I decided to place it outside and hope for the best, My research has been bringing so many different suggestions, but I am trying to emulate as much natural settings as possible. It's my first try and I really want it to prosper as it already has much sentimental value being a gift from my ill mother. Hoping for the best, your input is very much appreciated. Good grief! Can't have too many Toms & Thomas's here. Welcome. Ahhh junipers. Yeah, they do belong outside. They need the cold to put them into the required dormancy. Philly weather is not too severe. Yours appears to be just a baby. It should have some protection. A cold garage, enclosed porch, garden shed - something like that should be good. FORGET the watering instructions mentioned. Very little is needed during dormancy - while frozen. A little snow will be enough. Little or no light will be needed. It will lose some of the green, turn a bit brownish. That's OK. Come Spring (April) it will bounce back nicely! I like the last Toms answer better than my own. Never met a Tom I didn't like!